Inspired by the double whammy of a recent Frugal Traveler story and a yuzu ramen trip to Ebisu, we thought we'd try another. A sunny Saturday put us on our bikes for a 45-minute ride to Ivan Ramen over in Rokakouen. A non-descript little place on the corner of a little shopping street and a major road it would be easy to miss. But we'll attest it's well worth looking for. The long line of people patiently waiting not only marked the spot, but signified that something special awaited those who finally made it to one of the ten or so stools strung a long the L-shpaed counter. Ivan himself hopped out to say hello to folks in the line, and spent some time talking with us about his ramen and his story. Always mad about food and curious, he worked as a chef for a number of years in New York City before moving to Tokyo with his wife and family. After trying a couple different food ventures, Ivan turned his culinary hand to ramen. A quinticesential Japanese dish (borrowed from China then reworked), no other foreigner was making it. (How quinticessential? The variety of Japanese ramen is so immense that it even warrants a museum.) Most foreigners would shy away from trying to make this most Japanese of dishes for the Japanese, but not Ivan. A noodle man as well as a self-confessed Japan-o-phile, Ivan thought he would give it a go. He's not looked back since. 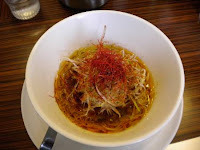 The menu holds some of the standard - shio (salt) and shoyu (soy-sauce) - ramens as well as tsukamens (ramen with sauce on the side for dipping) and mezemens (ramen with less broth and more noodle), but Ivan has created some of his own concoctions as well. Unable to resist his mouth-watering descriptions of the dishes, we ordered a mezemen of tomato, eggplant, and garlic simmered until the flavors melded perfectly. Topped off with fine threads of chilli it was a spicy bowl of perfectly al dente noodles that just looking at it warmed you up. My goma chilli (sesame seed and chilli) tsukamen came with some of the loveliest noodles I've had yet in a ramen shop. 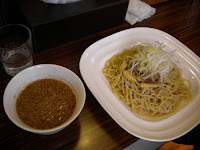 I couldn't eat my perfectly al dente rye noodles (usually they're wheat) or the sauce quite fast enough. (I seriously think I may have splashed my countermates as I eagerly slurped.) I really wanted to just drink down the sauce, but managed to control myself. Ivan takes great pride in his ramen - from noodle to broth - as well he should. Beginning with quality ingredients purchased as locally as possible - meat from the little shop across the way, vegetables and soy from around the corner - he churns out an everyman's dinner fit for a king and not more than 1,000 yen a bowl. Using a combination of chicken and pork fat he renders himself Ivan creates something that couldn't exactly be called health food, but that leaves the diner feeling good and satisfied at the end. "Ramen is not ramen without a healthy dose of fat. If that makes you uncomfortable, then eat something else," says Ivan. Ivan's eyes lit up when I mentioned how much I enjoyed the noodles, clearly taking great pleasure in his creation. The challenge of combining flours, rolling techniques, and recipes is for him as much about craft as it is about flavor and texture. He loves devising something tasty and satisfying for his customers to enjoy, and that keeps them coming back again and again. The noodle is the other half of his ramen equation. "Many ramen shops don't pride themselves on noddles, but on their soup. To me, making a memorable noodle is as important as a memorable soup," said Ivan. And it's about his customers. Keeping them happy and intrigued with his food while still experimenting with flavors and combinations is his pleasure and his challenge. "The barometer is is it tasty enough? I want my customers leaving here saying, 'That's the best noodle I've ever had.' and they do." What I found most appealing about Ivan's ramen (other than the noodles) was the philosophy behind it. "Slow food...fast" is his mantra, and the idea that "...fast food doesn't have to be junk." Ivan's commitment to creating the best ramen he can for his customers - ramen kodawari - means combining his experience and talent with his love of food, Japan itself, and ramen and bringing all of that to bear in each bowl. Traditionally a 'fast' food in Japan, Ivan takes the time to build a mouthwatering bowl of comfort from the best raw materials he can find. Watching him work behind the counter - tasting the broth, arranging the chillis and sliced onions, and gauging each customers reaction as they take that first slurp - made it clear that this was more than just noodles and broth with a bit of pork thrown in for good measure. It was craftsmanship. The skill and passion Ivan puts in every steaming bowl has resulted in recognition beyond the line outside his shop. Invited to participate in the Culinary Institute of America's 13th Annual Worlds of Flavor International Conference and Festival this year as a Japanese chef he is brimming with joy. The event, considered to be one of the premier events of the food world, brings chefs, food critics, and foodies of all types together for three days of intense learning, tasting, and talk. The theme for this year? Japan: Flavors of Culture. "I'm very passionate, and I'm the only one (foreigner) doing this stuff. I'm bilingual culinarily and linguistically. I'm very happy and very honored on three levels. I'm an American making ramen, affiliated with Japan, and an alumni," said Ivan. Rokakouen Station (North exit) on the Keio-honsen line.